LONDON--(Business Wire)--Technavio analysts forecast the global peanut allergy market to grow at a CAGR close to 90% during the forecast period, according to their latest market research report. 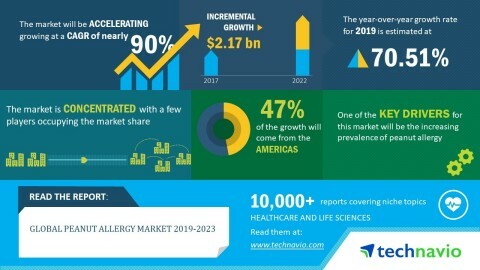 The spin-offs are done by companies to increase the focus on emerging business or for technologies that have the potential to disrupt the market is one of the major trends being witnessed in the global peanut allergy market 2019-2023. Spin-offs are done by companies to increase the focus on emerging businesses or for technologies that have the potential to disrupt the market. Universities and research institutes are also following this strategy to develop novel therapies to treat various indications. R&D involves most of the costs in the drug development process, thereby requiring vendors to manage fund requirements and seek collaborations for R&D. These collaborations allow companies to have a strong foothold for funds and skill set. Currently, research is dominated by small biotechnology companies, which do not have enough funds for research. These companies out-license molecules or technology platforms to large pharmaceutical companies and collaborate with them for various research programs. The global peanut allergy market research report provides market segmentation by product (peanut protein, vaccine, and others), and by region (the Americas, EMEA, and APAC). It provides an in-depth analysis of the prominent factors influencing the market, including drivers, opportunities, trends, and industry-specific challenges. Of the two major products, the peanut protein segment held the largest market share in 2018, contributing to over 89% of the market. This product segment will dominate the global market throughout the forecast period. The Americas held the largest share of the market in 2018, accounting for over 47% share. It was followed by EMEA and APAC respectively. Factors such as the increasing prevalence of the allergy and various initiatives taken by the US government toward spreading awareness about peanut allergies are expected to drive the market in the Americas during the forecast period.